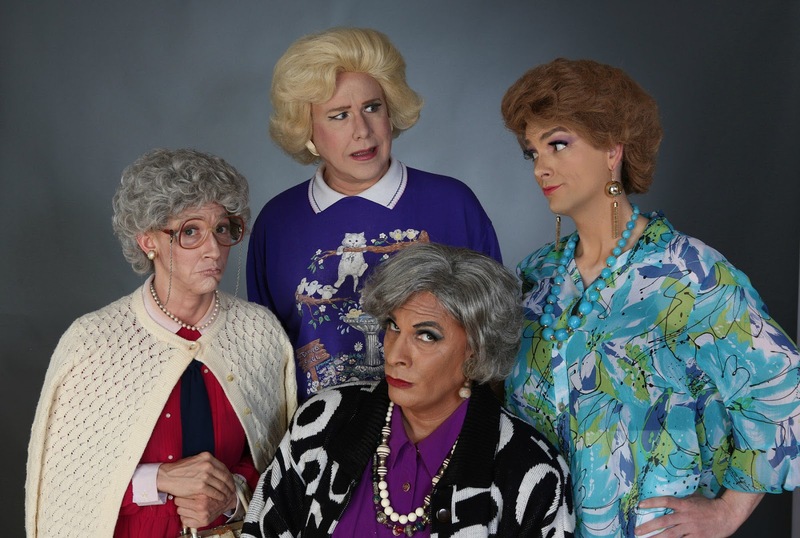 (left to right) Adrian Hadlock, Ed Jones, David Cerda and Grant Drager in a publicity image for Hell in a Handbag Productions’ parody THE GOLDEN GIRLS: The Lost Episodes, Vol. 3. THE GOLDEN GIRLS: The Lost Episodes – Vol. 3! I'll be ChiILin' with these comedic queens, for the Opening/Press performance: Saturday, April 27 at 7:30 pm, so check back soon for my full review. I adore Hell in a Handbag's fabulous parody tributes to the adventures of Dorothy, Rose, Blanche, and Sophia and I catch every show I can. 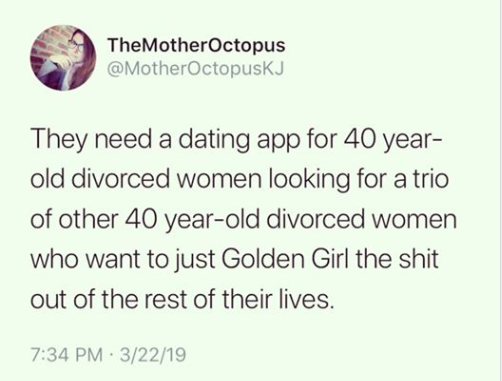 This little gem came across my facebook feed last week and cracked me up, with it's absolute truthiness. Wise words for all of us regardless of age, gender, or marital status... I want in, and I'm starting that mission with a spring dose of inspiration via GOLDEN GIRLS: The Lost Episodes! Join Dorothy, Rose, Blanche, Sophia and their whacky friends and relatives for all new adventures – including the first-ever musical episode. Written by Artistic Director David Cerda and directed by Miles Brindley, the latest installment of Handbag’s hit sitcom parody will play April 25 – August 31, 2019 at Mary’s Attic, 5400 N. Clark St. in Chicago’s Andersonville neighborhood. Tickets are currently available at www.handbagproductions.org or by calling (or by calling (800) 838-3006. The press opening is Saturday, April 27 at 7:30 pm. THE GOLDEN GIRLS: The Lost Episodes – Vol. 3 will feature Adrian Hadlock* as Sophia, Ed Jones* as Rose, David Cerda* as Dorothy and Grant Drager* as Blanche with Chazie Bly*, Lori Lee*, Michael Rashid, Danne Taylor and Robert Williams as various silly characters. Episode One: Caged Miami Heat – Find out what happens when the girls are arrested and thrown in jail for the murder of their long-lost cook, Coco (Michael Rashid). Episode 2: Singing in the Pain – Can Rose (Ed Jones) overcome her crippling stage fright and perform a duet with her idol, Lyle Waggoner for the big Miami’s Ladies’ Auxiliary fundraiser? This is the first Golden Girls musical episode, so be prepared for songs like, ‘Back in St. Olaf’, ‘You’re a Tramp, Blanche’, and many more. THE GOLDEN GIRLS: The Lost Episodes series began in 2017 and has been going strong ever since. Chicago loves Handbag’s long-running parody of the classic TV sitcom with original scripts. The production team includes Christopher Rhoton (scenic design), Gregory Graham (costume design), Danny Rockett (sound design), Keith Ryan* (wigs design), Pam Berman (props design) and Noah Watkins (technical director). Curtain Times: Thursdays at 7:30 pm (through May 30); Friday and Saturday at 7:30 pm (through June 29, plus Friday, August 30 & Saturday August 31); Sundays at 5 pm (June 16, plus June 30 – August 25). Please note: there will be added performances on Sunday, May 26 at 5:30 pm, there will not be a performance on Sunday, July 7 or Sunday, August 4. Tickets: Previews: $19. Regular run $27 in advance, $31 at the door. Group rates $20 for 10 or more. Tickets are currently available at www.handbagproductions.org or by calling (or by calling (800) 838-3006. Miles Brindley (Director) is a director, actor and stage manager originally from South Dakota. After graduating from the University of South Dakota with a BFA in Acting, Miles has worked as a stage manager for Long Beach Opera, a company actor for The Black Hills Playhouse, a music theatre director for the International Music Camp, a drama instructor for both Campbell County High School and Freeman Academy, as well as various rolls with several community theaters. Miles' most recent directing projects include Steel Magnolias, Joseph and the Amazing Technicolor Dreamcoat, Beauty and the Beast Jr. and The Music Man.